COMPETITION CLOSED: Thank you all for your amazing entries. We have selected a winner who will be notified in the next few days by L.K.Bennett. Thank you again and loved all your Pinterest boards. We are now officially in holiday mode and our favourite part of Christmas is gifting! Keeping that in mind, the first gift we'd like to give out this year is to you. We've teamed up with L.K.Bennett to offer one reader the chance to win one of the new L.K.Bennett Rosamund Bags (worth £425) from the Spring Summer Collection, plus a special surprise hidden in the bag for the lucky winner. So here's how it works. Head on over to Pinterest and set up a board titled "My Life in a L.K.Bennett Handbag." Within this board, pin all of the things you would dream of doing with your L.K.Bennett Rosamund bag. It could be lunch with the girls, a theatre visit, shopping in New York, strolling the streets of Paris. Use your imagination, the sky's the limit and money's no object here. We want to know everything you would do if someone handed you the keys to the planet and said, "Go forth and have fun, handbag in tow." Now onto the nitty gritty: Each board must feature five items of clothing from the L.K.Bennett site, as well as one Rosamund bag. That's it, all done, and half way there to winning the L.K.Bennett Rosamund Bag. Just make sure after you've created your board that you leave a comment below linking to the Pinterest page so we can check it out! The competition runs until December 16th, when a winner will be chosen by us and notified! If you need a little help to get started, check out the board we've put together - "My Life in a L.K.Bennett Handbag." 1. This competition is open to residents of United Kingdom aged 16 years or over, with the exception of employees of the L.K.Bennett and Fashion Foie Gras, their families, agents and anyone else connected with this promotion. 2. Entries must be received by December 16th. Only one entry per person. 3. 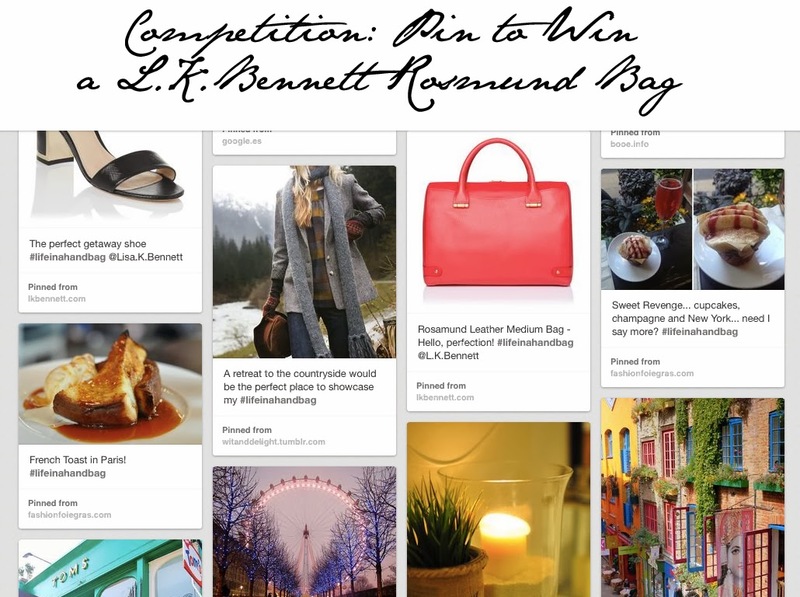 To enter create a Pinterest board titled ‘Life In A L.K.Bennett Handbag’ and fill it with ‘pins’ from lkbennett.com and other websites representing the lifestyle you would associate with the Rosamund Bag. The board must contain at least one SS14 Rosamund bag and five pieces of L.K.Bennett clothing. 4. All entries will be forwarded to a judging panel made up of Fashion Foie Gras and a representative from L.K.Bennett. The winner will be the entry that in the opinion of the judges’ best fulfils the competition brief. 5. The prize for the winner is a Spring/Summer 2014 Rosamund handbag, worth £425, in a colour of the winner’s choosing. 6. The winner will be notified via email by December 17th. The winner must claim their prize within 14 working days. If the prize is unclaimed after this time, it will lapse and the unclaimed prize will be offered to a substitute winner selected in accordance with these rules. 7. By entering this competition each entrant confirms that his/her entry is their wholly-owned creation and to the extent that such entry makes use of any third party materials that these have been fully cleared unless they are no longer protected by copyright or other intellectual property rights. 8. By entering the competition each entrant agrees to be bound by these terms and conditions. 9. This competition is hosted by Fashion Foie Gras on behalf of L.K.Bennett Limited, 3 Cavendish Square, London, W1G 0LB.